The Mass Effect series from Bioware has reached an end. 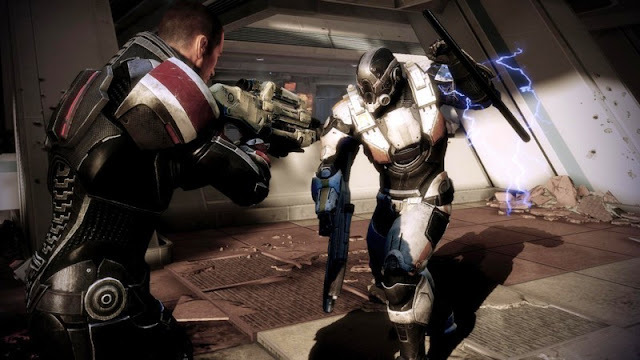 It began its life on PC and Xbox 360 in 2007, continued its story of the universes Reaper attack in 2010 with one of the best games made this generation: Mass Effect 2. And now, we get the final part of the story. Mass Effect 2 is what you call a perfect sequel; it took the fantastic atmosphere and setting of the original game and fixes everything. It overhauled the gameplay of ME1 and controls so much it felt like a new game entirely. So well-made was ME2, that I gave it a well-deserved 10/10. ME3 then, does it match up to its nearly perfected predecessor? Story wise ME3 picks up fast, it throws us right into a desperate time where Earth is on a full attack from the Reapers. This desperation and witnessing of innocents getting destroyed is a very strong introduction to the game. It kind of sets the mood for the whole story of ME3. It's a fight against time and the galaxy is indeed in its most desperate fight for survival. 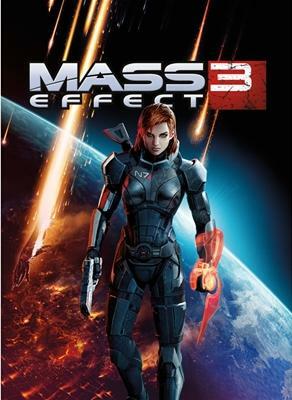 ME3 keeps you on your toes at all times and constantly puts you in difficult situations. You get to learn how bad the Reaper attacks truly are when you visit other planets and species. This is a fight will be a struggle for Shepard as she/he tries to make all the different races and species collaborate to defeat the Reapers. Captain Anderson overlooks Earth being attacked by the Reapers. ME3 takes a slightly different approach to ME2's very open ended game, the galaxy map is more closed in, it feels more dangerous and the exploring isn't quite as pleasant as in ME2. I found the galaxy map kind of annoying with the Reapers sending you away constantly, but it sets the mood. Compared to ME2's maybe a bit too thorough scanning of each planet it's a clearly different approach and is fine considered you probably spent a lot time doing this in ME2 and don't feel the need to explore like this over again. ME3 is in this regard more linear, you know where it is heading, but it throws a few twists along the way and each planet you visit contains surprises. Enemies in ME3 are smart and aggressive, your skills will be tested! Although ME2 had its controls laid out perfectly, ME3 manages to pull off some small enhancements. You now have a roll button, so you can dodge away from attacks, it feels slightly faster and the covering is even better than before. In fact it feels like Gears of War only slightly slower. The greatness of the gameplay, combined with it's even smoother layout in ME3 proves itself in the multiplayer mode. 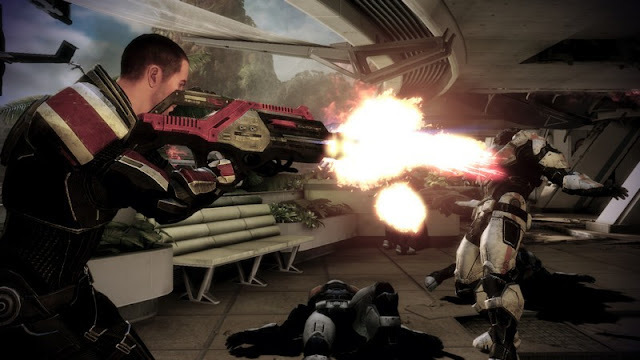 Yes, ME3 has multiplayer, but not the traditional deathmatch style. It's horde mode up to four players. Believe it or not, it actually is excellent and really fun to play; you level up characters here and can send them into the singleplayer experience to heighten your galactic readiness against the Reapers. It's fun enough playing together with randoms and truly entertaining with friends. A fantastic addition to the series. ME3's shooting feels fantastic and never tires. ME3 looks superb, it may overdo the contrast level for my liking, but the technical side of the game is excellent. The lighting looks fantastic and the character models are amazing. Bioware have really outdone themselves and have made the Mass Effect series into some of the most beautiful games around. I love the variation and colour palette within its worlds. Every new location is a joy to visit and admire. It keeps the excitement at a high throughout the game. 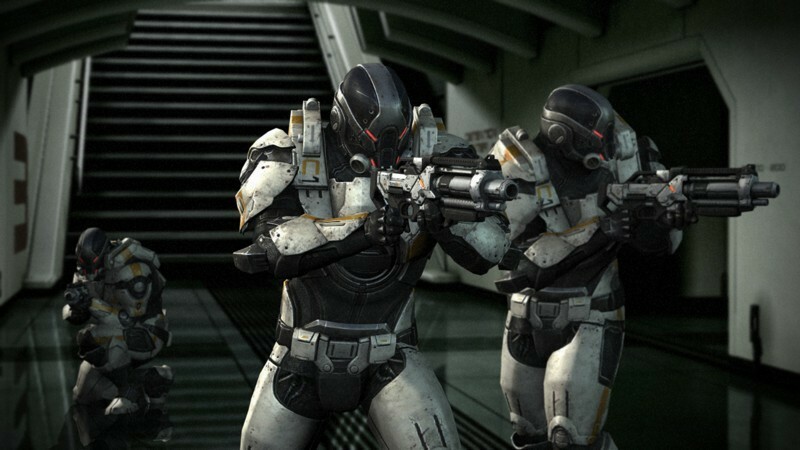 Cerberus soldiers looking for Shepard to fire at! There are a couple of nit-picks though. 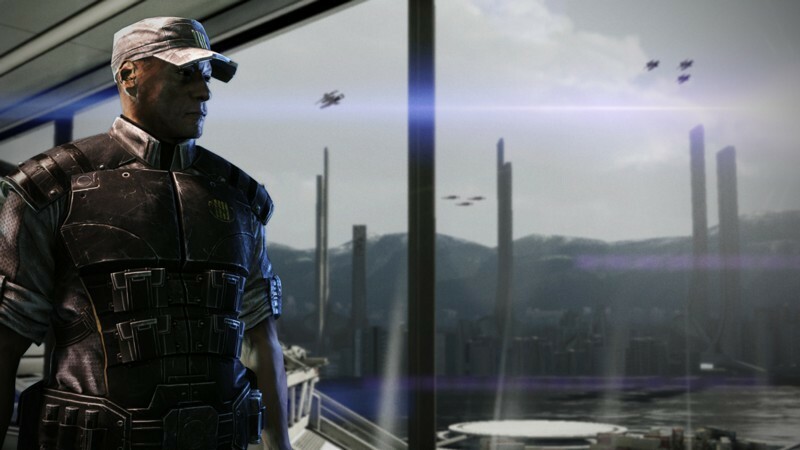 I would have perhaps, after the huge decision and very different outcomes ME2 seemed to show at the end of the game preferred a possibility for making almost two separate storylines in ME3. All the choices made in ME2 seem to send you down the same route in ME3, good or bad. The ending though, which met a lot of critics, didn't bother me at all. Sure the different endings don't vary much, but I didn't feel like they needed to as ME3's story was more predetermined than I hoped it would be. I would have also preferred that some of the places you visit didn't look like multiplayer maps and the Asian ninja type of character was so bad it was annoying. Cocky ninjas with grumpy behaviour and completely outdated weaponry (who the hell uses a sword in a distant future against guns?!) should return to rubbish Japanese games that love this kind of stupidity. The Melee attack helps a lot in close-combat situations. 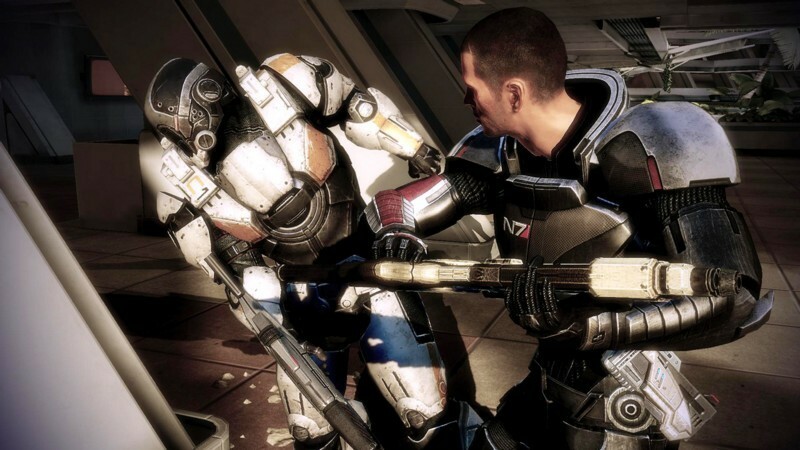 Mass Effect 3 sets the bar for many other games considering presentation, voice acting and cinematic feeling. It ends a fantastic trilogy and shows a scale of a fight to survive and a galaxy at war even Hollywood movies would be jealous of. Finally reaching the end of the story I have followed through three games felt really epic, and it felt a lot seeing what happened to all the characters. A truly fantastic game that should be considered one of the best this generation alongside it's slightly better brother ME2.